As I have mentioned before, I love pasta and being pregnant, I really love it even more. The thing is, pasta is not a health food. Grains treated with high heat to make cute shapes does nothing nutritional-wise, except make things worse. My husband doesn’t eat grains (he follows a mostly primal diet) and I mostly only eat sprouted grains (more Weston A Price diet). Maybe if I bought my own sprouted grain and made fresh pasta I would feel less guilty about eating it. Anyways, we never buy pasta, but the other day when I went grocery shopping I found myself in the pasta aisle and I starting comparing different brands of pasta and came across Ancient Harvest gluten-free quinoa pasta. Quinoa pasta sounds like a good substitute for regular pasta right? One side panel (I know, too small to read, the only pictures I could find, from GFR Grocery) gives the protein content of different grains (quinoa is technically a seed, however). And what does the box outline? That quinoa has more protein per serving than the other grains listed. More protein is a good thing. If you only read this side panel, things would seem pretty good! Unfortunately, When you take a look at the nutrition facts, this “quinoa pasta” has almost half the amount of protein as regular pasta (regular pasta has 7 grams). And how can that be, when quinoa has so much more protein? Because the main ingredient in this pasta is corn flour (not quinoa! ), and corn has less protein than many other grains! So I guess Ancient Harvest was hoping you would only read one side-panel and not compare it to regular pasta? The quinoa pasta has 2 more grams of fiber and more sodium as well. At least the corn flour is non-gmo and organic. I’m a picky red-sauce eater. Most restaurant sauces make me gag; they are too sweet and I don’t care for the green pepper taste that many of them seem to have. I prefer to make my own sauce at home. Spaghetti was one of the first things I learned to cook – my dad taught me, so I have fond memories with it as well. This week I was craving spaghetti sauce but since we aren’t eating pasta, I could only eat the sauce. 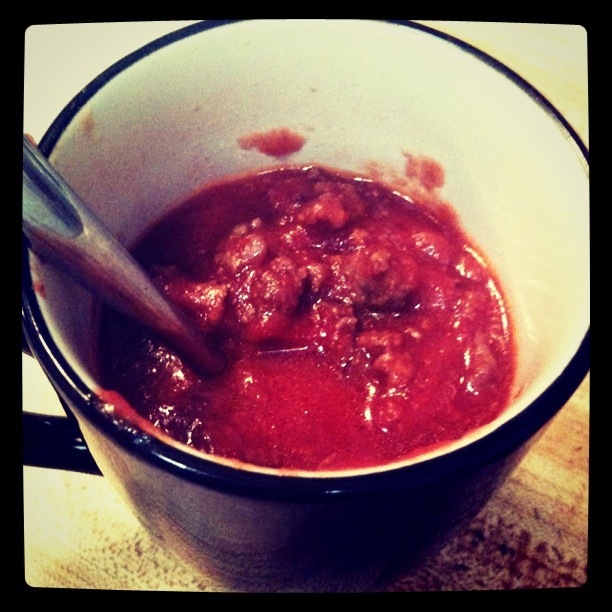 Then I got to thinking, meat sauce is just like tomato soup with ground beef (close enough, right?). So I kept telling myself that it was perfectly okay to eat the sauce sans noodles. And I still enjoyed it. I could try it over zucchini strips (aka zucchini pasta) or any other vegetable. You can also dip celery or vegetables into it, or just eat it with a salad. It’s still warm and sunny here, but this would be a nice winter meal, too.